A team of researchers at the University of Pittsburgh reached the conclusion that bioplastics are not as green as they were thought to be, but rather carry the guilt of pollution from the soil (through their biodegradability) to the atmosphere. They published their findings in a report in Environmental Science and Technology. Indeed, bioplastics (or biopolymers) are biodegradable, but the problem lies somewhere else. They’re made from corn, starch and other renewable resources, but the fertilizers, pesticides and the chemical processing needed to take them from dust to final product bring more greenhouse gas into the atmosphere than making them from petroleum. In order to reach this conclusion, the team analyzed seven petroleum-based polymers, four biopolymers and one hybrid, performing a life-cycle assessment on each of them. After that, they checked each of the plastics in its finished form against principles of green design, including biodegradability, energy efficiency, wastefulness, and toxicity. 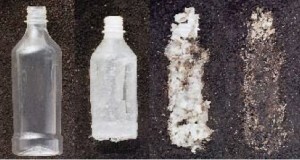 The two tested forms of sugar-derived polymer — standard polylactic acid (PLA-G) and the type manufactured by Minnesota-based NatureWorks (PLA-NW), the most common sugar-based plastic in the United States — exhibited the maximum contribution to eutrophication, which occurs when overfertilized bodies of water can no longer support life. One type of the corn-based polyhydroyalkanoate, PHA-G, topped the acidification category. In addition, biopolymers exceeded most of the petroleum-based polymers for ecotoxicity and carcinogen emissions. Combining the two types of polymers in the hybrid one sums all the pollution of biopolymers and the petroleum-based ones. The so-called B-PET is the most harmful to produce and use. I guess the same can also be applied to biofuels, but the solution doesn’t necessarily rely on halting all of the biopolymer production, but rather discovering methods of more efficient and green farming, without the use of harmful fertilizers and chemicals. It’s the same as with the Prius, for example. Its lithium ion batteries pollute on another level than burning gasoline does. Solving this issue doesn’t necessarily mean that we shouldn’t use batteries anymore, but it’s imperative that we find a better energy storage. Bioplastics are an eco-based alternative to traditional plastics. However, many questions remain over their environmental impact and how best to implement them. Degradable plastics are primarily made of petroleum products. Because of this, although they breakdown when exposed to light or air, they are not considered “biodegradable”. Bio plastic is green alternative. It is eco friendly. By shifting towards eco friendly products we can save our environment. Bio plastics are used in packaging, agriculture, medicine, automotive, textile, cosmetics and many other areas. Bio plastics are designed to be composted, not recycled. The caveat is that bio plastics has to be separated from conventional plastics so that it doesnÃ¢â‚¬â„¢t contaminate their recycling. The substitutes can increase emissions of greenhouse gases on landfill sites, some need high temperatures to decompose.